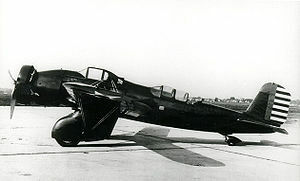 The Curtiss A-12 Shrike was the United States Army Air Corps' second monoplane attack aircraft, and its main attack aircraft through most of the 1930s. It was based on the A-8, but had a radial engine instead of the A-8's inline, water-cooled engine, as well as other changes. The Model 60 was developed from advancements of the A-8 and the experimental YA-10. However, it became obsolete after a short use period, mainly because of fast-improving aviation technology, as well as the USAAC's desire for multi-engined attack aircraft. The most obvious difference between the A-12 and the A-8 is the air-cooled, radial engine in the A-12, which replaced the A-8's inline, water-cooled engine. This was a response to the USAAC's move toward a preference for radial engines, especially in attack aircraft. The rationale behind this preference is that the radial engine has a lower profile, making it less vulnerable to ground fire, and a simpler cooling mechanism, which is also less prone to groundfire, as well as overall maintenance problems. These aircraft retained the open cockpit introduced in the A-8 production batch, and carried the same weapons load. In an attempt to improve pilot/observer co-operation the rear cockpit was moved forward sufficiently for its glazed covering to form a continuation of the fuselage decking behind the pilot's cockpit. Nine USAAF A-12s were still in service at Hickam Field on December 7, 1941 but saw no combat. A-12s served with the 3rd Attack Group plus the 8th and 18th Pursuit Groups. Surviving Shrikes were grounded just after Pearl Harbor was bombed in December 1941. Chinese Nationalist Air Force received 20 A-12 Shrikes in 1936, arming the 27th and the 28th Squadron of the 9th Group. When the full scale war between Japan and China broke out, they were used. The initial success including the downing of four Japanese Aichi Type 94 carrier-based light bombers on 15 August 1937. However, after deploying in ground support missions in Shanxi, most did not survive and the extremely few left were reassigned to training duties. Fitzsimons, Bernard, ed. The Illustrated Encyclopedia of the 20th Century Weapons and Warfare, Vol. 21 London: Purnell & Sons Ltd., 1969, First edition 1967. ISBN 0-83936-175-0.